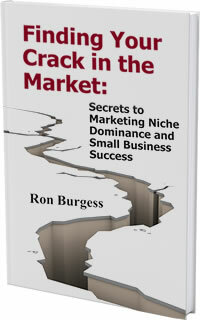 Free Chapter of "Finding Your Crack in the Market"
Need help "Finding Your Crack in the Market?" Receive a free chapter and see if your company is positioned to dominate your market niche. Anyone who owns or runs a business will appreciate the 40 years of business insight that Ron Burgess explores, and guidance he provides that you and your business needs to find a crack, develop it, protect it and build wealth. Fill out the form below to have the "Free Chapter" emailed to you.